Are You Ready to Hit the Mark? John Foley logged thousands of hours in the cockpit of F/18s and other jets when he was an aircraft carrier pilot, a Naval instructor pilot for the Marines and a member of the Blue Angels flight demonstration squadron. He’s logged thousands more hours traveling the world as a much-in-demand keynote speaker. 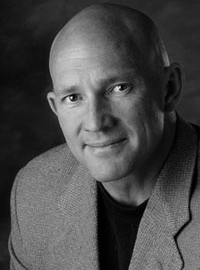 John inspires audiences with his energy and his commitment to serving others, while also providing a unique framework that makes High Performance possible for anyone in any organization. 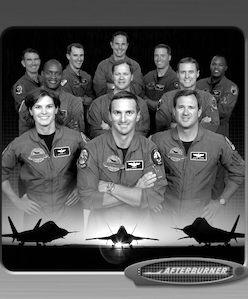 John is a graduate of the United States Naval Academy and a former lead solo pilot of the Blue Angels. He holds masters’ degrees in business management, from the Stanford Graduate School of Business (as a Sloan Fellow); in international policy studies, from Stanford University; and in strategic studies, from the Naval War College. 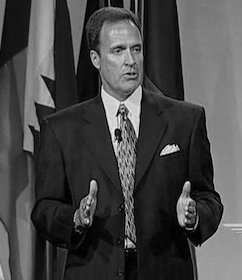 Before launching his speaking career and training businesses, John worked with a venture capitol team in California. 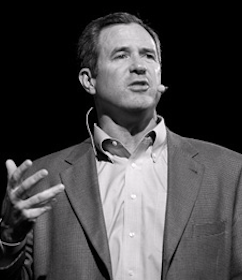 In addition to delivering 60 to 100 keynote presentations each year, John also runs his own company and a foundation. He is the founder and president of CenterPoint Companies, which provide business performance training to Fortune 500 corporations, professional associations, and educational organizations around the world. And his Glad To Be Here® Foundation funds charitable works all across the globe.